Identify appropriate field service personnel, assign to task, and execute efficiently based on dynamic state of equipment being serviced. Application dynamically locates and assigns best worker based on location, experience, and equipment. Worker is actively tracked to destination to ensure timely response. As work is being completed, appropriate actions are being guided by collaborative system that may include the real-time status of the equipment while it is being serviced, augmented reality, communication with subject matter experts, continuous online service information updates, and the shipping and tracking of any additional parts. any organization that has to maintain widely-distributed equipment or machines. Mitsuiwa currently has a maintenance engineer call system which provides technical support for Fujitsu computers and equipment. They are building a modern application using VANTIQ including management reporting and interaction which will dynamically assign engineers based on location, skill level, and availability via smart phones. VANTIQ quickly assigns a person with the right skills and immediately provides human collaboration when there is any doubt of the best match. The current ticketing system receives issues from customers, but lacks an automated assignment system. Everything is manually done and lacks real-time visibility. 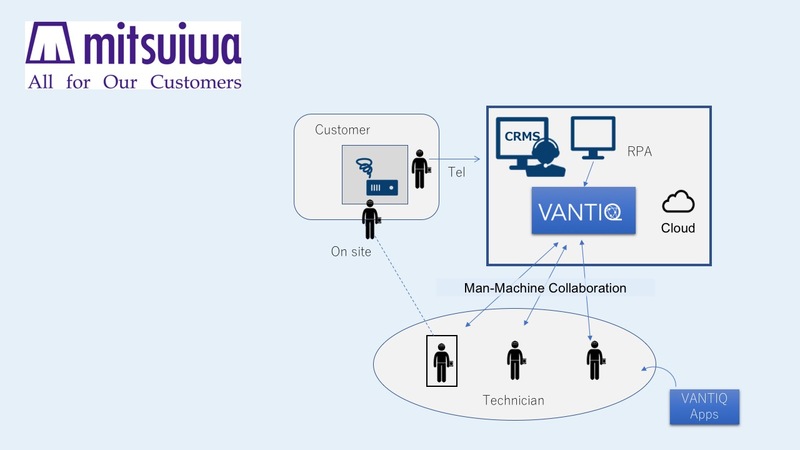 The VANTIQ application reduces time for assigning engineers from 20 minutes to just a few seconds with improved accuracy to provide better customer support. Cost savings result by decreasing administrative staff. Because of aging demographics in Japan, this is very important. Learn more about real-time field service solutions here in the VANTIQ real-time field service management white paper.